As you probably know, once cats discover what fun it is to unroll a roll of toilet paper, they will seek out and gleefully dispense entire rolls in one sitting. Some cats even go to the trouble of shredding the ever loving holy jeebus out of the downed paper, thereby rendering it unsuitable even for its original, rather modest purpose. My cat Shiro is a pretty good boy, and he really loves to play. Recently he started experimenting with TP unrolling a little, and I knew it was going to be all downhill from there. I didn’t think scolding him would be effective, and besides that, I like to save “being angry” for the really serious offenses. After pondering this problem for a while, I decided what I really needed was some kind of security mechanism that would defend the roll against cats but allow people to use it with a minimum amount of hassle. The inner diameter of a TP tube is significantly larger than the outer diameter of my TP roller. So I found a plastic pillbox and wedged it between the TP tube and the roller axle. It fits very snugly and sticks out on one side (along the axis of the roller itself). 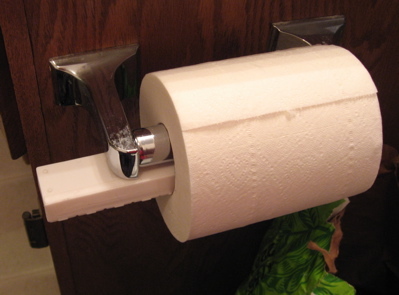 This way, when the TP roll spins, the side of the pillbox-wedge bumps against the arm of the TP holder and prevents further rotation. A simple mechanical stop. Humans can either unfurl the TP manually despite the wedged roll, or else remove the pillbox and proceed to use the system per its original factory specifications. Cats are thwarted because they 1) don’t understand why the spinny thing doesn’t spin and 2) don’t have thumbs anyway. Occasional claw marks on the TP roll indicate just how successful this system has been against my local cat adversary. So what I have done, effectively, is create a test that allows all humans to pass, and forces all cats to fail. As I was using this invention earlier this evening, I suddenly realized that I had inadvertently implemented a perfect kitten captcha! Nice idea. You could also just use the previous roll’s remnant tube in the gap like your pillbox. Kitten captcha, that’s funny! this website is obsessed with cats… I likw=e it!!! Or… turn the roll around so it unrolls from the back instead of the front. This works 99% of the time and you don’t get inconvenienced. It’s funny, I’ve searched several places on the internet on this topic and keep seeing the “turn the roll around” answer. Those people must have short bus kitties or have never actually had the prolem. It only took my kitten one try to realize the rolling thing wasn’t working right anymore and it needed to use its teeth to pull every square out going the other way. A ahahaha.. short bus kitties. It’s true though; not all cats are equally clever. If you have a kitty who can use doorknobs he can probably figure out how to reverse-roll.